The football fraternity in Ballymena and further afield has been stunned by the sudden death of well-known coach Wesley Gregg. The Irish Football Association Grassroots Development Officer for Mid and East Antrim passed away on Sunday night. Although a native of the Coleraine area, Wes was a familiar figure in schools and football clubs within the Ballymena area. Through his work, he was often seen at football grounds in this area, passing on his expertise and passion for the game to children. He was in Ballymena as recently as Saturday past, where he oversaw the P2 section in the Ballymena Invitational Mini Soccer League. 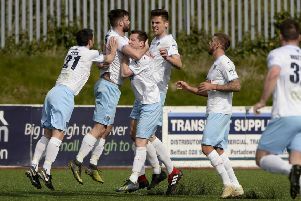 Wes was on the coaching staff at Ballymena United under Roy Walker’s management in 2010 before moving on in April 2011 when he joined his boyhood club Coleraine. However, he retained a strong link with football in this area, with local youth football clubs receiving the benefit of his knowledge, while he also played a key role in shaping the careers of many coaches as they embraked upon gaining their coaching badges.